Category: Sun Cream & BB Cream. •A patented SKYLAKE herbal extract calms and moisturizes irritated skin and is an almost natural material by containing natural preservative only. •Adding the ingredients for UV protection, whitening and elasticity, it protects skin against pollution and UV rays and keeps it clean and elastic. •It helps make makeup look soft, supple and smooth by providing sufficient moisture and nutrients. •With superior spread ability and covering of skin, it creates a natural skin tone and leaves a fresh feel. 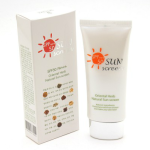 Be the first to review “Multi BB Cream” Click here to cancel reply.